Professor Ragnar-Olaf Buchweitz, a mathematician and the former vice-principal (academic) and dean at the University of Toronto Scarborough, has won a Humboldt Research Award from Germany. This prestigious award recognizes a lifetime of achievement in research and is bestowed by the Alexander von Humboldt Foundation, a German-based organization that promotes academic cooperation between excellent scientists and scholars from abroad and from Germany. Awardees must be nominated by a German academic and receive funds totaling 60,000 Euros (roughly $77,000 Canadian) as well as getting the opportunity to spend up to a year co-operating on long-term research projects with colleagues at German research institutes. The research awards are earmarked for eminent researchers at the peak of their academic careers whose fundamental discoveries, new theories or insights have had a significant impact on their own discipline and who are expected to continue producing cutting-edge achievements in future. On June 22, the Humboldt Foundation will present the research award at a ceremony at Berlin’s Schloss Charlottenburg Palace. Buchweitz said he plans to divide his research time over a three-year period. Currently in the city of Bochum in western Germany, he will be pursuing research projects with at least three universities: Ruhr-University in Bochum, the University of Kaiserslautern in southwestern Germany, and the University of Bielefeld in the northwest part of the country. He has also been invited to speak at universities in Saarbrucken and Munster, and to attend various other professional activities and events. Buchweitz was nominated by his mathematical colleagues, Professor Hubert Flenner of Ruhr-University and Professor Gert-Martin Greuel of the University of Kaiserslautern, and current director of the Mathematics Research Institute in Oberwolfach, Germany. Buchweitz has collaborated with Flenner and Greuel for more than 20 years. Another bonus of the research award is that “Humboldtians” join a large, worldwide network of fellows and are able to accept post-doctoral fellows sponsored by the foundation. 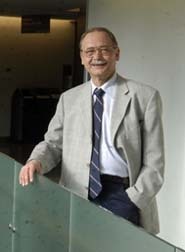 Buchweitz’s research focuses on the mathematical fields of commutative algebra and algebraic geometry. He mainly uses tools from homological algebra, which some describe as the most abstract form of pure mathematics. The Humboldt Foundation presents fellowships and awards each year that allow researchers to go to Germany to collaborate on projects there. The foundation boasts more than 24,000 alumni worldwide. For more details, click here.